$200.00 per performer plus travel if necessary. I perform as the legendary Divine Miss M also hosting my own celebrity impersonation revue with over 20 different celebrities in each show. From Bette to Lucille Ball, Beyonce to Patti LaBelle and everything in between, we have a ton of celebrities to fit your needs. We can do everything from full on performances to just walking around entertaining your crowds. We have played for small audiences of 20 to large crowds of 1000 or more. Price Range: $200.00 per performer plus travel if necessary. A full on performance, back up dancers may or may not be provided depending on space allotted. All performances are lip sync performances, we will need microphones to host and introduce the performers. We will need a DJ or someone to run sound and lights if you are providing that, if we have to find it, there will be additional costs in the set up and running. I have been in the business of female / celebrity impersonation for over 18 years. 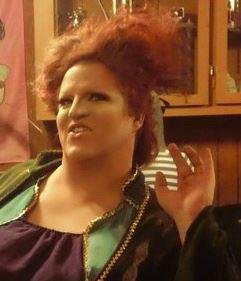 I perform as Bette Midler, Wynonna, and Boy George. I began my own production show in 2008 called Divalicious Cabaret. It has over 12 performers doing at least two some up to four characters each in one particular show. We lip sync to popular songs that people will recognize and dance and laugh with. I have a host of celebs from Bette, to Liza and Judy, Lucille Ball, Patti LaBelle, Whoopi Goldberg, Beyonce, Cher, Dionne Warwick, Diana Ross and Divine. And that's just to name a few. We will need ample time to prepare for your event. If you have something planned the more time we have to prepare for it the better it will be for you. We can do one performance up to an entire concert set with at up to 12 performers at one time. Each performer can do a minimum of two characters sometimes more depending on the time allotment. Each performer needs a minimum of 30 minutes to change makeup and costumes for each character they are doing. Frank Marino from Diva's Las Vegas.